Bannockburn was a pivotal battle in British history. It remains Scotland's most celebrated military victory and ranks as one of the most humiliating defeats England has ever suffered. As such it was a formative influence on the national identity of both countries. 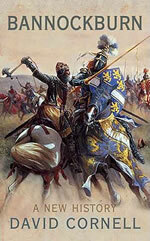 Its extraordinary outcome lends Bannockburn an enduring fascination and yet there has been no major revision of the battle for almost a century. Many questions still remain unaswered. By thoroughly re-examining the sources, and by firmly placing Bannockburn in its political context, it is possible to provide answers for these questions and to begin to understand how such an extraordinary outcome was possible. Bannockburn is also dominated by great historical figures such as the Black Douglas; Giles d'Argentan, the third best knight in Christendom; the notorisouly incompetent Edward II; above all by the iconic figure of Robert Bruce. Their roles in this bloody encounter are also fully retraced along with the chaotic horror of the battle itself. David Cornell was born in Leicester and educated at Loughborough Grammar School. He read History at Durham University graduating with a First. During his time at Durham he was introduced to the Scottish wars by Professor Michael Prestwich and he subsequently returned to Durham to as a postgraduate where he spent several years researching the wars. He was awarded a PhD in early 2007 and is currently engaged in further research and the writing of a number of academic articles. "A full and convincing account of the battle of Bannockburn, positioned within a political and military context." "..he brings the latest scholarship to life in an engrossingly detailed and yet unfailingly exciting study." "Presented with such a scholarly and well-annotated book, the question arises as to whether one could recommend it to a non-specialist readership. In this case on can do so without hesitation..."
"There is much to commend this book...his battlefield descriptions are extraordinarily imaginative and vivid. But everything is based on a meticulous and sound reading of the available documents and contemporary accounts and his style brings his subject to life." "excellent analysis of Edward 11’s political ineptitude and Robert the Bruce’s strategic skills...Bannockburn is a terrific story." "a full and convincing account of Bannockburn, which skillfully situates the battle in a valuably broad historical context. Dramatic, solid and thoroughly readable."